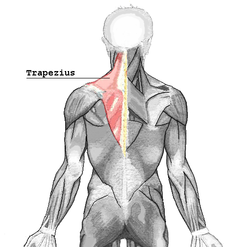 Position of trapezius and its parts. The upper fibers elevate the scapulae, the middle fibers retract the scapulae, and the lower fibers depress the scapulae. In addition to scapular translation, the trapezius induces scapular rotation. The upper and lower fibers tend to rotate the scapula around the Sternoclavicular articulation so that the acromion and inferior angles move up and the medial border moves down (upward rotation). The upper and lower fibers work in tandem with serratus anterior to upwardly rotate the scapulae, and work in opposition to the levator scapulae and the rhomboids, which effect downward rotation. An example of trapezius function is an overhead press. When activating together, the upper and lower fibers also assist the middle fibers (along with other muscles such as the rhomboids) with scapular retraction/adduction. Due to not being healthily developed for some people, it can easily cause problems such as muscular tensions, especially the descending part. In severe cases these might cause a cervical spine syndrome. Trapezius palsy is characterized by difficulty with arm adduction and adduction, drooping shoulder, and poorly localized shoulder and neck pain. Although rare, trapezius deficiency has been reported to correlate to neck pain and poor scapular control that are refractory to physical therapy. ^ "Tufts". Archived from the original on 2003-04-22. Retrieved 2007-12-11. ^ Arthur F. Dalley, Keith L. Moore, Anne M.R. Agur (2010). Clinically oriented anatomy (6th [International] ed.). Philadelphia [etc. ]: Lippincott Williams & Wilkins, Wolters Kluwer. p. 700. ISBN 978-1-60547-652-0. ^ GmbH, DocCheck Medical Services. "Cervical spine syndrome - DocCheck Flexikon". DocCheck Flexikon. Retrieved 2017-11-09.